The purpose of a smoke detector is to alert you to smoke and a fire in your home. Fires can spread rapidly, so the early detection of smoke can potentially save your life. Understanding the best placement of smoke detectors helps you to maximize the life-saving benefits that these devices provide. Consider location as you determine the best placement of smoke detectors at home. The location of your units determines how quickly they’ll detect smoke and how easily you hear the alarm. Fires are more likely to start in some areas of the home and you’ll want alarms to alert you of the danger. Smoke naturally rises so it will accumulate near the ceiling before it begins filling the lower part of a room. 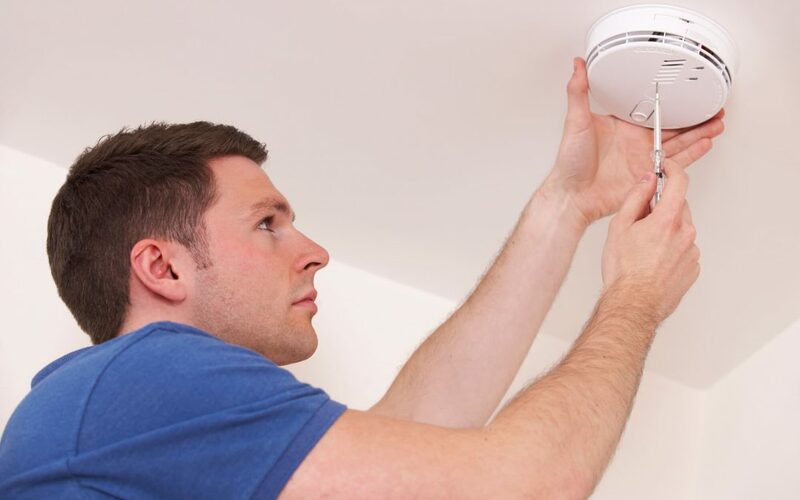 Smoke detectors will detect smoke faster when they are installed overhead. Air vents push smoke away from the detectors, so avoid placing detectors directly in the path of air from HVAC vents. Cooking fires on the stove and in the oven are common. While some of these fires break out when you are nearby, others may begin when you have stepped out of the room or left a burner on unintentionally. By linking your detectors together, everyone in the home can receive a notification about a fire at the same time. The best placement of smoke detectors in the kitchen is several feet away from the primary cooking areas to prevent false alarms. Dryer-related fires happen because of the heat that the dryer generates. This heat is removed through a ventilation duct, but the lint trap in the dryer and the duct can become clogged with lint. When this happens, the dryer gets superheated and the lint catches fire. When selecting the best placement for smoke detectors in the home, install a smoke detector near the clothes dryer. Bedroom doors are often closed at night and fires can break out on either side of the door. The door slows the passage of smoke, so installing detectors on both sides of a bedroom door is a smart idea. You may be particularly vulnerable in this area of the home because you are not as alert while relaxing, reading a book, watching TV, or sleeping. Prepare for a potential fire by knowing the best placement of smoke detectors in the home.